We were pleasantly surprised to have received one of our most anticipated products a few weeks early! Annie Sloan's latest book, Color Recipes for Painted Furniture and More, is a masterpiece of design and creativity. 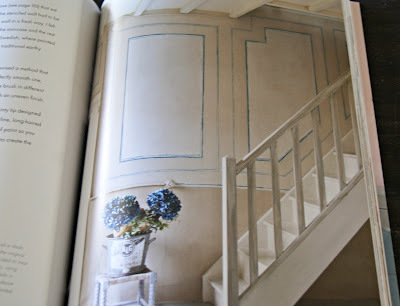 It includes 40 new projects, almost all of them created originally for Annie's country home in France. 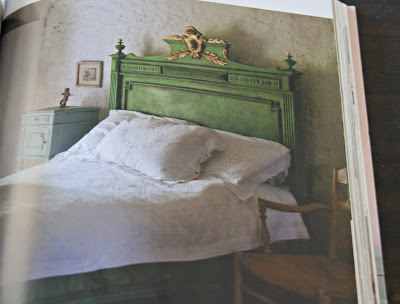 Our favorite has to be this French Napoleonic bed, which adds what Annie calls an "outrageous pomposity" to this otherwise subdued and neutral room. Each of the projects includes step-by-step instructions to recreate the looks presented in the book. We love the mixture of Antibes Green, dark wax, and gilded accents on the bed. It's absolutely gorgeous! 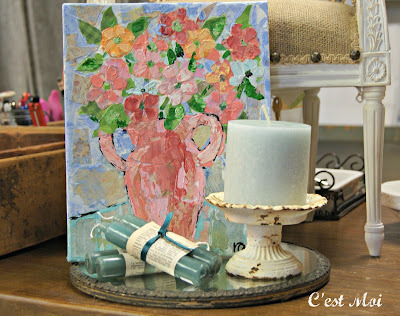 Some of the techniques she uses are new to even the most ardent Annie Sloan aficionados. 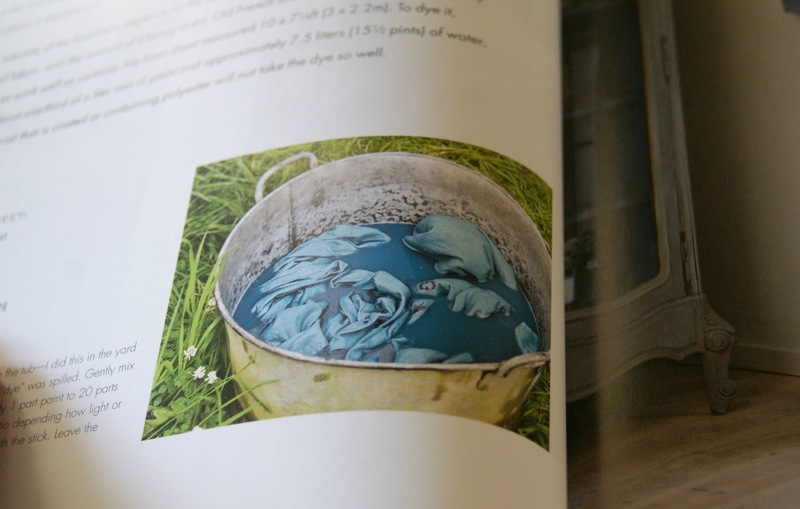 Did you know, for instance, that you can use CHALK PAINT® to dye fabric?! 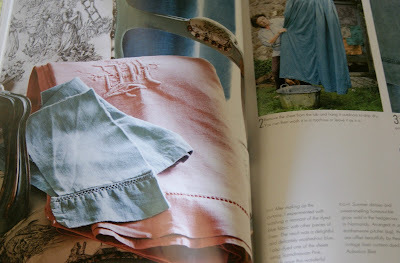 Annie has dyed monogrammed linen fabric and used it for upholstery, bed linens, and curtains. The fabric below has been dyed Aubusson Blue and Scandanavian Pink; the book includes instructions on not only how to dye fabric but how to vary the intensity of the final colors. One of the best aspects of Color Recipes for Painted Furniture and More is the collection of various styles Annie showcases. 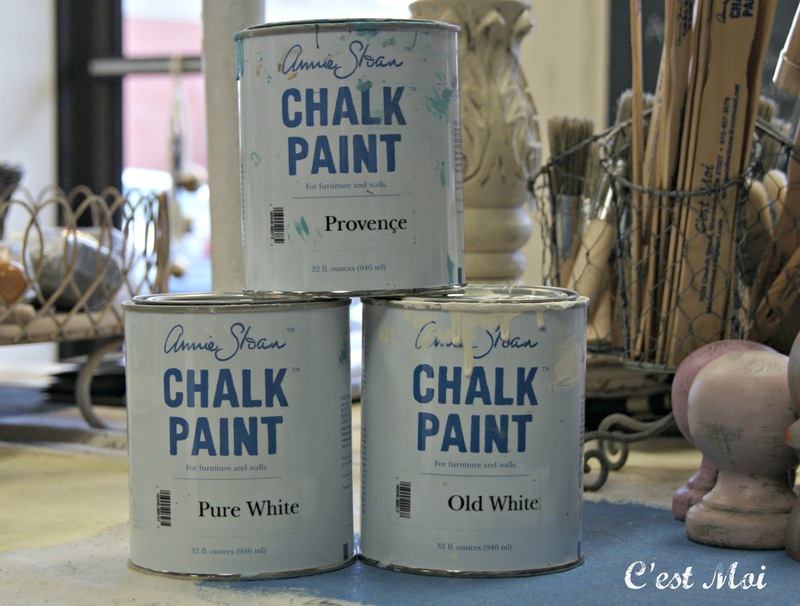 Not only does she use CHALK PAINT® to create pieces inspired by classical French style, but adds Boho Chic, Modern Contemporary, and Country styles to the mix. This painted panel wall is a beautiful example of Swedish style, along with the textured pine staircase that Annie washed with Old White and Paris Grey. Those who have taken our advanced workshops will recognize the technique on this stenciled wall. 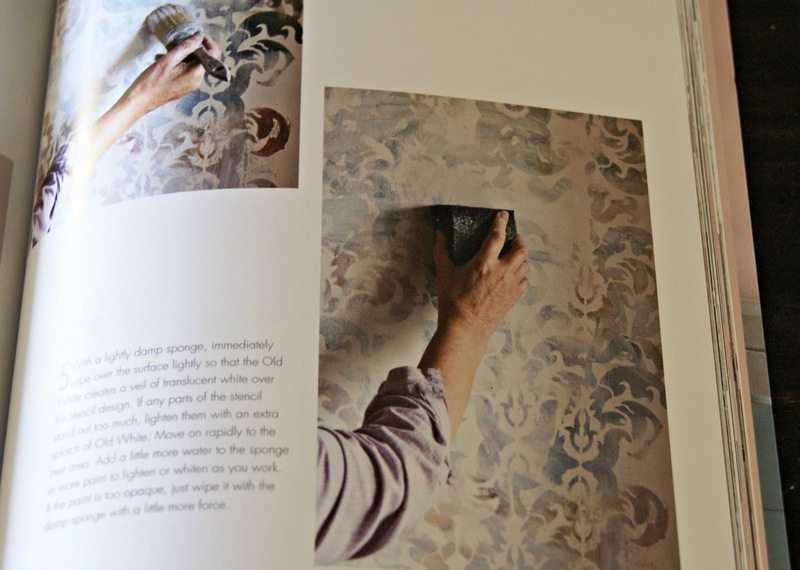 For one of the walls in her home, Annie used four colors and one damask stencil to create a bold, layered design. 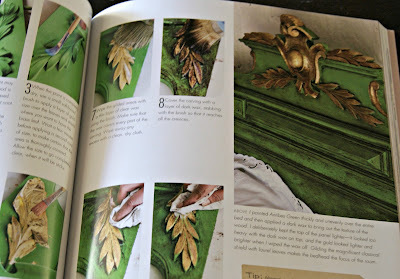 The step-by-step instructions explain how to apply the paint with varying degrees of pressure and how adding a wash of Old White on top can develop a more subtle, worn look. These are just a few of our favorite projects from Annie's new book; it also includes an entire section on understanding and combining colors from her CHALK PAINT® line. 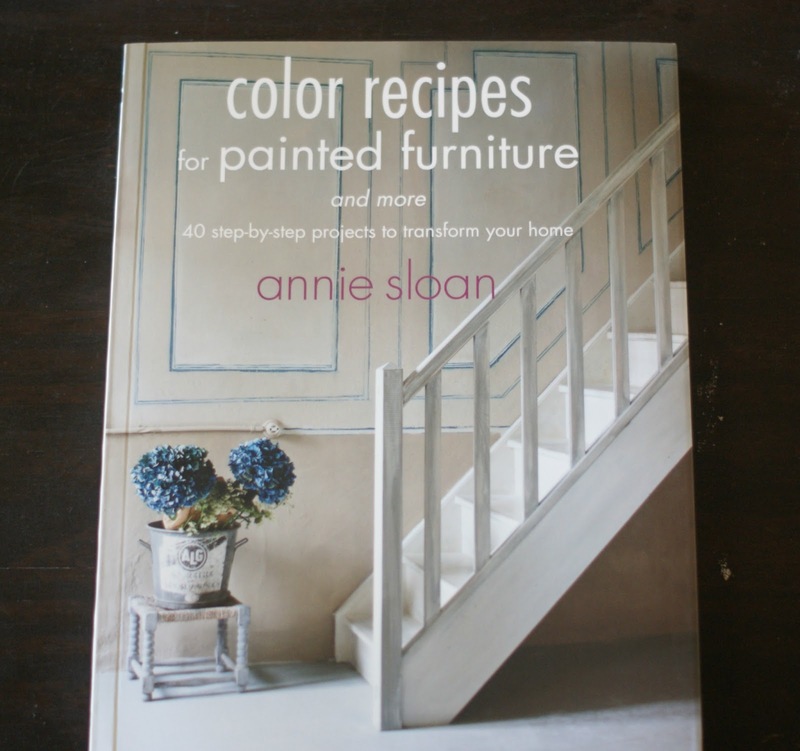 We would love for you to come in and see for yourself why Color Recipes for Painted Furniture and More is the perfect introduction to transforming your home! 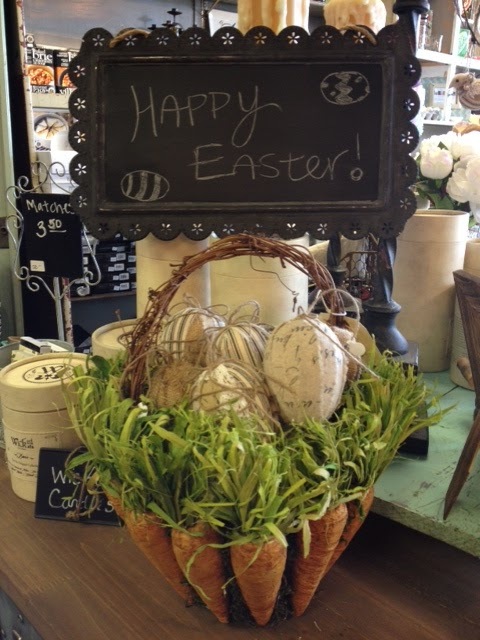 Easter is arriving early this year, but we're more than ready! 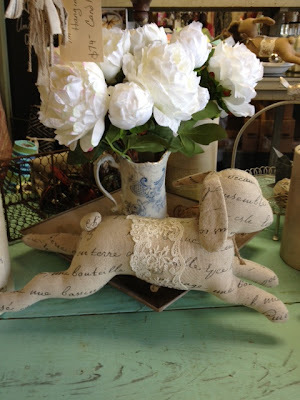 The shop is full of Easter whimsies, including this adorable basket. The carrots are formed from paper mache, while the over-sized eggs have been covered with varying patterns of frayed fabric. The same fabric covers this lovely little bunny. The neutral linen, French script, and lace accent makes this a beautiful addition to elegant, vintage Easter decor. Simply beautiful! We also love this bunny, painted in watercolors by the wonderfully talented Wendy Day. Her vibrant art adds such happiness to the shop, we know it would do the same when nestled among other pieces in a loving home! We wish you all a lovely Easter and hope to see you soon! We are so happy spring has finally arrived! After a somewhat long, dreary winter, we are ready to welcome the beautiful weather and abundance of lovely flowers that bloom here in Middle Tennessee. If you're stuck inside, you can always invite spring indoors. 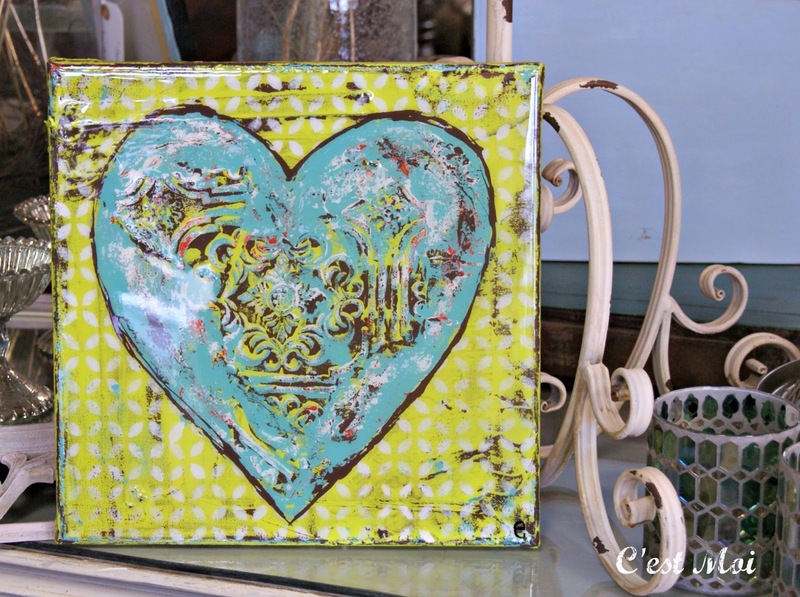 The mixture of colors in this piece by Rita (Rann) Woodward makes us swoon; its bright and cheerful energy will enliven any space that needs a little freshening up! If you're looking for something a bit smaller, Kellie Montana's miniatures are the cutest addition to a home we've ever seen. While we love the flowers she's painted, the cow and donkey are just too adorable for words. 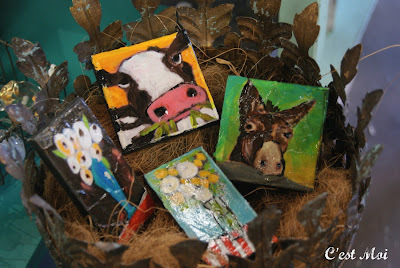 Mini Montanas make a perfect gift for those who appreciate a bit of whimsy! 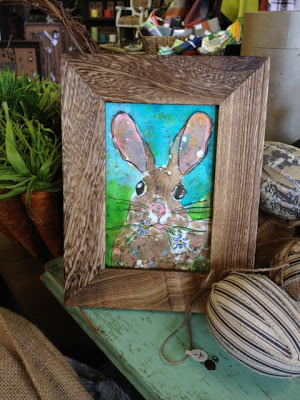 Like Rita and Kellie's work, Emily Little's latest creations emanate the vibrant colors of spring. The combination of yellow, blue, and white remind us of clear blue skies and fields of daisies or daffodils. 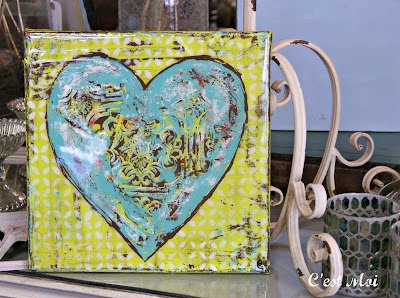 The heart design and patterned background, however, make it a piece we'd gladly display year-round! 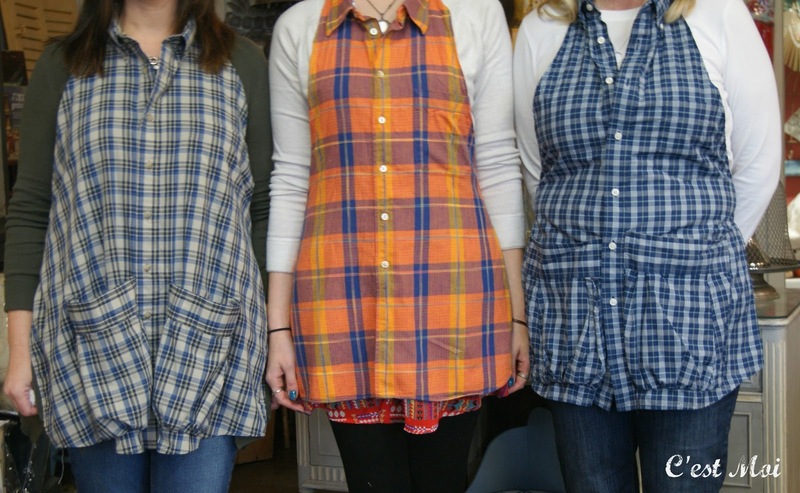 Ellie Gladden is an artist in her own right, though she uses a medium other than paint to create her masterpieces; she transforms menswear into these charming aprons. The collared, button-up shirts become decidedly feminine when front pockets are added and the fabric is trimmed to fit less masculine shapes! We use Ellie's aprons all the time in our workshops, as her creations are both cute and comfortable! into the bright realm of possibility. 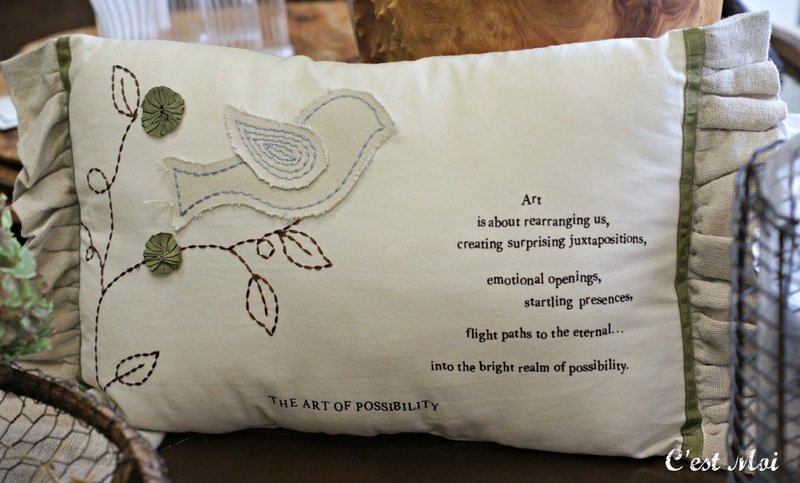 The mixture of earth tones, stitching, and burlap trim makes it more than a backdrop for poetry, though. It's an absolutely beautiful accent piece that we would love to take home with us! 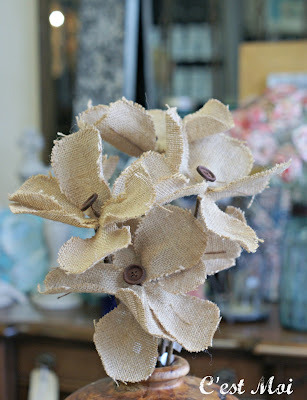 It would look perfect next to these burlap flowers. Accented with tiny brown buttons, they come together to create a romantic yet understated floral arrangement ideal for those who enjoy simple, classic designs. Not having to water them is just an added bonus! For those looking to update accent pieces rather than buy new ones, there's nothing easier or more dramatic than new furniture hardware. 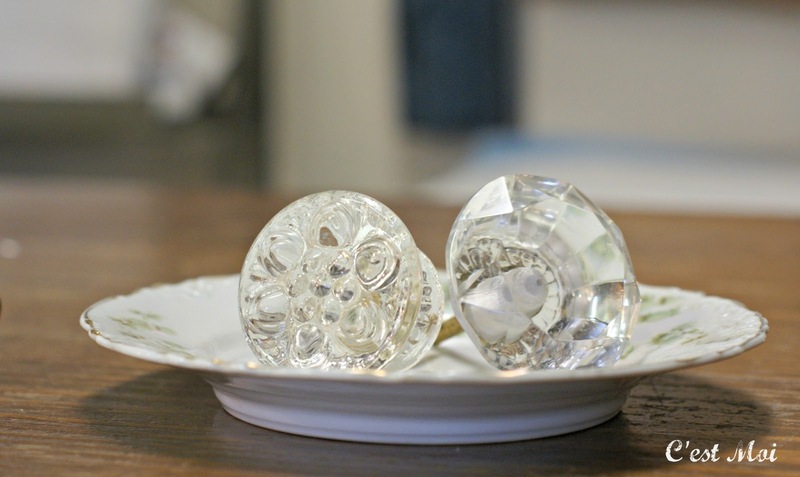 These over-sized crystal knobs are stunning, and anyone who comes in the shop and sees them in person has a hard time resisting them! Their clear color and design makes them neutral enough for any style, while their size and brilliance makes a dramatic statement. These, on the other hand, are just as beautiful but are certainly not neutral. They are decidedly vintage, adding an antique charm to what could be an otherwise neutral piece. 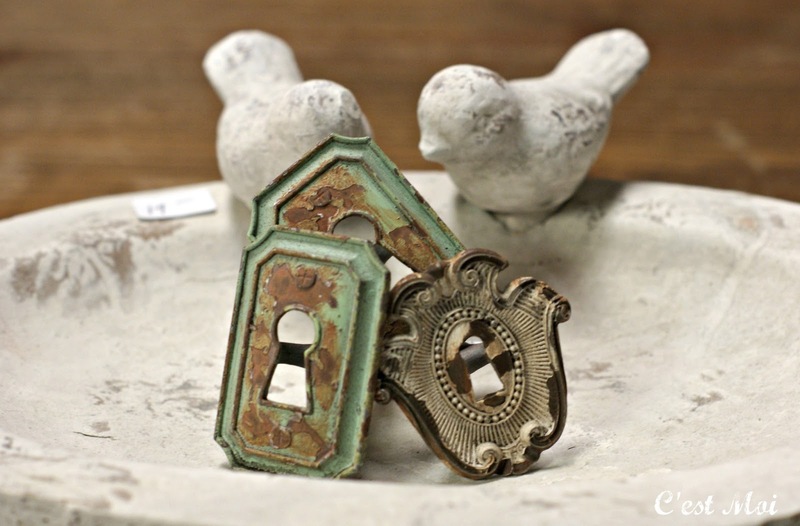 Perfect for anyone going for a classic shabby chic look! It's been a while since we've been able to paint a piece and show it off, so it's nice to finally be able to present this little bookcase to our readers and customers. It started out looking like this; it was just a plain wood finish with gold hardware, a look that we're sure all of you are familiar with! 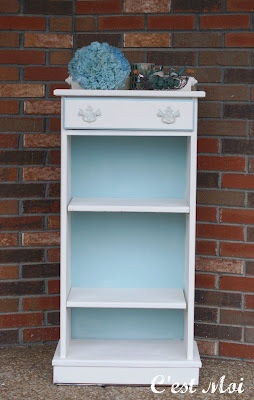 We were happy to transform it, though, as usual with CHALK PAINT® by Annie Sloan. We're ready for spring to arrive, so we used light colors to brighten her up. We actually used a 50-50 mix of Pure White and Old White to achieve the look of Original White, a color available only in England. It's a beautiful mixture and creates a perfect, soft neutral shade. 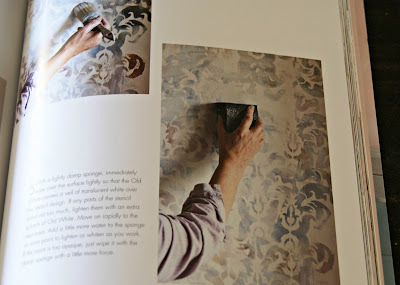 For the back of the piece we used a 50-50 mix of Old White and Provence, for a lighter version of one of our favorite blues. But here's our secret weapon! Shellac is a natural sealer made from the resin of the lac bug, which lives in the forests of India and Thailand. 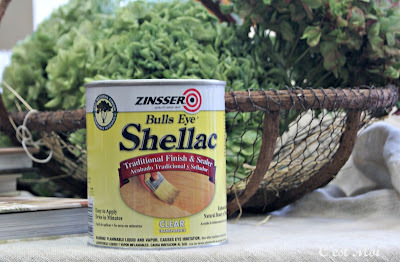 The most important aspect of shellac for us, however, is that it solves the bleed through problem. Most of the time, you won't realize there's bleed through until you've already painted the first coat. That isn't a problem. 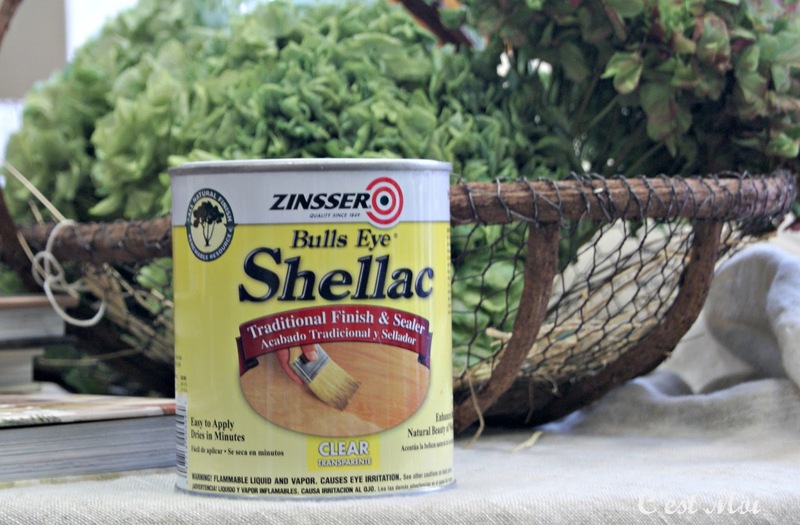 Simply apply the shellac over the paint, allow it to dry, and continue painting. We prefer to use a rag, which doesn't leave texture like a brush would. If all of this paint talk has you itching to learn more, we have several workshops coming up! 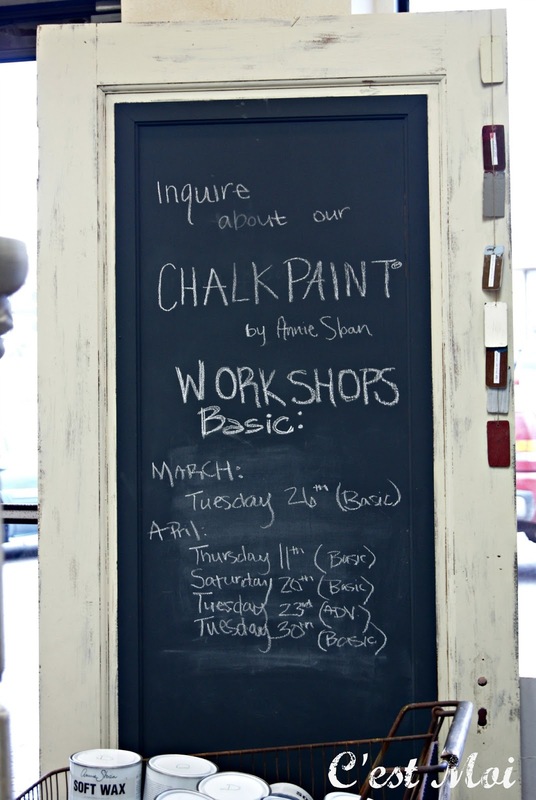 Whether you're a complete beginner and have never even seen CHALK PAINT­­® by Annie Sloan or would prefer to take an advanced course, we have plenty to offer! We would love to see you there, and please call or stop by the shop with any questions you have!